All onions used in this soup are sweet onions that were grown on Awaji Island. This soup can be diluted with an equal quantity of water. Simply defrost in the refrigerator or beneath running water, combine with water, boil, and enjoy. Each package is 150g total (enough for 2 servings) and arrives frozen. 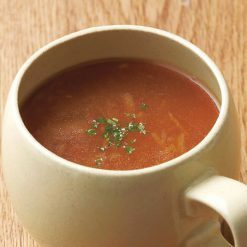 Enjoy delicious onion soup, without having to worry about that onion smell getting all over your cutting boards, knives, and hands! All onions used in this soup are sweet onions that were grown on Awaji Island. Onions contain small quantities of vitamin C, vitamin B-6, and potassium. They also contain some quercetin, which may help to ease artery-related inflammation and thus lower risks of heart disease. To defrost: The soup can be placed, still in its unopened bag, either in the refrigerator or beneath running water to defrost. To eat: After defrosting, pour the soup from the bag into a pot. Add an equal quantity (150mL) of water, and heat until a gentle boil is reached. Stir well, and then transfer the soup into bowls or containers. Alternatively, the soup can be left undiluted and used as bouillon in curry or stew. If the bag comes into direct contact with the rim of the pot, or if the bag is sticking out or hanging out of the pot, the bag can melt; creating holes in its surface. Please boil with care. Use plenty of caution when opening the bag, as the bag and its contents will have become very hot. 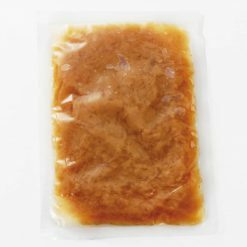 This product contains chicken bouillon, onions (Hyogo Prefecture, Awaji Island), cornstarch, chicken extract, beef extract, soybean oil, brandy, butter, table salt, sugar, seafood extract, yeast extract, pepper.. This product is not suitable for anyone with allergies to milk, wheat, beef, soy or chicken. Origin of ingredients: onions (domestic). Prepared and packaged in Japan.